This operation was conducted on the night of August 15/16, 1944. The airfield at Valence La Tresorerie, located in the Rhone Valley of France, was being used by Ju-88 fighter-bombers and anti-shipping strike aircraft. It was therefore targeted in connection with the invasion of Southern France. Having returned with Wellington LN855 from Celone the previous day, James MacIsaac and his crew again took off from Tortorella in "D" and set course for the aerodrome at 1851 hours. 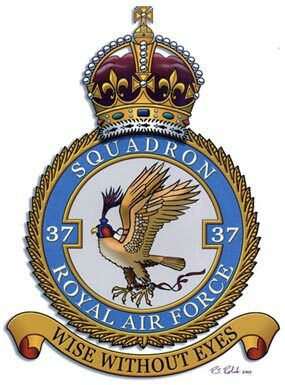 In all, ten Wimpys of 37 Squadron participated in the attack. The Pathfinder Force of No. 614 Squadron was detailed to provide illumination and TI’s. Unfortunately, the Pathfinder Force was unable to locate the target. They dropped their red TI’s nearly ten minutes late and in an area which photographs revealed was 20 degrees and six miles off target. A green TI was dropped three miles off target in the same direction. Illumination, dropped 20 miles north east of the target also attracted some bombing. All ten bombers dropped on the TI’s or illumination, dropping eighteen 500 pound bombs, seven 500 pound bombs with a six hour time delay fuse, three 500 pound bombs with a twelve hour time delay, and twenty one 250 pound bombs. Undoubtedly due to distance from the target, flak was negligible and no enemy aircraft were seen. There were no losses. F/Sgt. MacIsaac bombed on the red TI’s and returned to Tortorella, touching down at 0327 hours.